How did you come to know each other and to collaborate? Jephan: I met Patrick a few years ago when he organised an exhibition in Belgium. We got on extremely well, and saw each other many times, and then he told me he wanted to make a play or something – he's a circus man, a theatre man. And we talked and talked, and I taught him a lot about my childhood and the way I was unhappy with college and being ill many times, and about how I dreamt about the circus or maybe becoming a clown or an archaeologist or a sculptor. When, as a child, I moved to Belgium I discovered a wonderful forest, the Forêt de Soignes, where I started to pick up new materials – driftwood, leaves, feathers and so on and started making things with them, with these bits of old stuff. I became a sculptor. 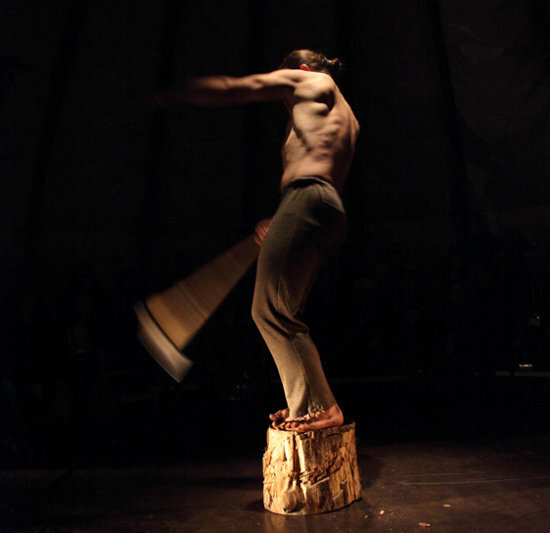 Did the materials of Jephan's sculptures – fallen wood, leaves, objects from the forest – suggest the materials that the acrobats work with in the piece? Patrick: Yes, but not too much. We didn't want to make an illustration – it's not necessary. So we just tried to have a sensation about this young – very young – boy, and about a feeling of dischord. Jephan: It's all about being a fourteen year old – when I was about fourteen, fifteen I dreamt what I wanted my life to be. I almost knew what it was going to be like, and I can say today that what I was dreaming came true – I really lived what I wanted to live, which was wonderful, in spite of all sorts of things. It felt very much like a work that had been made for the tent, and for me there was this sense of being outside but also confined. Did you make the piece specifically for the chapiteau? Jephan: What is quite extraordinary is that I have just finished a series of sculptures which are exactly the shape of the chapiteau – made with organic things, found beside the ocean. And I really had shock when I saw it for the first time, because this thing would be played within almost a piece of sculpture, or something looking like one of my pieces of sculpture. And it's all the time the same thing – coincidences that happen somewhere in time, or in the imagination, or in meeting someone. Things, you know, go well. And this is why I'm so moved when I see them acting – in a piece of sculpture. At the end they [the performers] put these sort of strange egg shapes in the ground, and their memories are carried in the shape of these things. And this [gesturing to the tent] is also almost like half an egg. So we go into the memory – we go in the memory to tell the story. It clicks very well, because it's about memory. Patrick: And we need a tent, a little tent, because we want to present the work in a real proximity with the public – putting them close to tragic sensations, and to fear, and all the sensations we can find in the traditional circus. Theatre now is more in the head, and we try to find physical sensations in the public, letting them react to what happens here on stage. Jephan: There have been many stages, because the show was played in Antwerp, in Belgium, and was a great success. But it was quite different and then we talked again and developed this new show. Patrick: It's the first time we've used a puppeteer, but it was a good idea because we need not the reality, just a sensation. This way we work with a child and it is OK to come inside his world. Were there specific images in the piece inspired by Jephan's work? Patrick: It's very, very difficult to answer because I saw a lot of exhibitions of Jephan's work, but I really didn't want to make the same thing. So I needed a lot of time, a lot of trial and error, and it's like intuition – I think that's the best way. Jephan: The extraordinary thing is that I have seen the show ten, fifteen times, and every time I see something new, and I discover little things that are true and that remind me of things that I never told him. The powder, the white powder [referring to a scene where the acrobats throw the puppet boy onto an iron bed and blow white powder into his face] – it's because I was visited every day by a very old and frightening doctor, and he looked at me and prescribed white powder with water. I had to drink this, and it was horrible, so I hated him. And I told Patrick, White powder, white powder everywhere, and it works very well. You have a singer, a chanteuse. It's an odd decision perhaps to place a song at the end of the piece, and I was wondering how she came in. Patrick: It's a way of working that I'm really interested in – mixing different techniques. My last show was opera and circus, and I really think – between that one and this – it's the same way of working. I want to find a way of working with different people, different personalities, but different techniques. It takes a long time for it to be OK – for it not to be best act, best performer, best singer. I try to make it a group – I don't like heroes. We are all the same, so I try to find a way to say that. L'Enfant qui... played inside the Chapiteau Lissagaray 23-29 October 2010 as part of Festival Circa. You can read Sideshow's review of the production here. Also you can read more about Théâtre d'un jour's work on the company website, and are encouraged to check out the online gallery of Jephan de Villiers' work. Interview conducted 28 October 2010 in the warm, close interior of Chapiteau Lissagaray in the 20 minutes before L'Enfant qui...'s penultimate Auch showing.